YouTube has unveiled its own live TV service carrying major U.S. broadcast networks, regional sports networks and some cable networks. 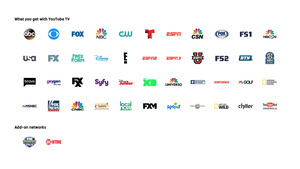 Major networks including ABC, CBS, FOX, NBC and ESPN are part of the new YouTube TV service, which promises to break customers away from commitments and viewing limitations associated with subscription TV services. The servicer also offers dozens of additional cable channels like MSNBC, Fox News, FX, USA, E!, Bravo, the Disney Channel, Sprout and more. YouTube TV costs $35 per month, but you can choose to cancel it at any time rather than committing to a long contract. A cloud DVR service can also be used to record programming and store it for nine months. You can watch YouTube TV on any screen, whether mobile, tablet or computer, and you can easily stream to your TV with a Google Chromecast or Chromecast built-in TV. YouTube TV membership also provides access to YouTube Red original content. Ok. So this looks like the future. I don't suppose it will be available outside the usa for awhile.